Photos and videos now available here. 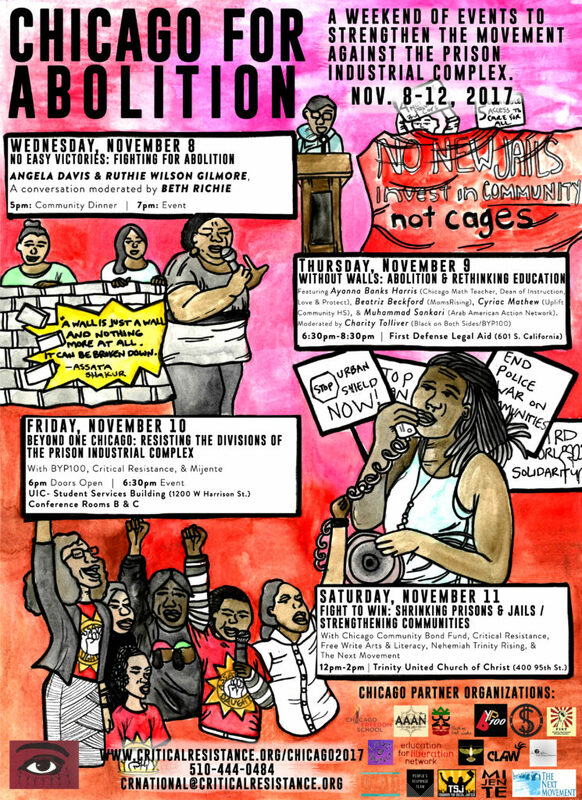 A weekend of events to strengthen the movement against the prison industrial complex. Nov. 8-12, 2017. 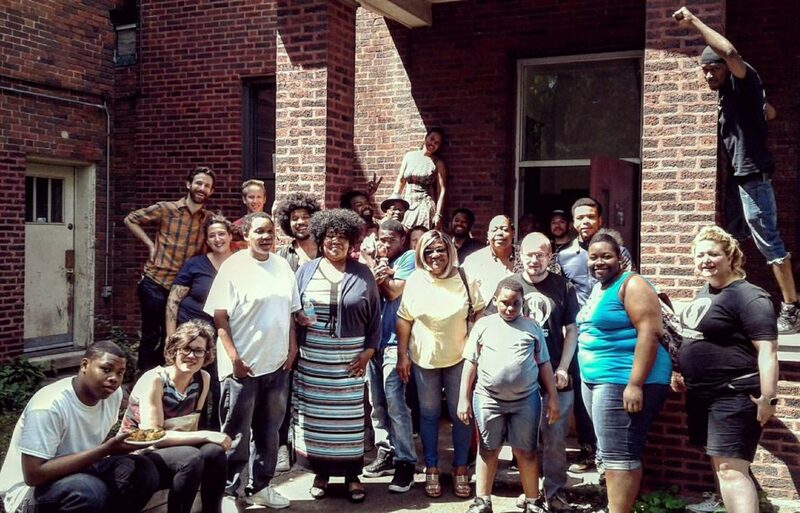 In this period of astonishing energy and public discussion about abolition, Critical Resistance (CR) is excited to build with organizations and communities in Chicago that are fighting to address and eliminate the harms of the interlocking systems of policing, imprisonment, and surveillance—what we call the prison industrial complex (PIC). As we approach 20 years since the first Critical Resistance conference and our early campaigns, CR is committed to building a stronger abolitionist movement nationally. We are humbled and glad to work with communities in Chicago as part of this effort. Through a weekend of events, workshops and political dialogue, we seek to build a stronger organizational relationships and a stronger shared understanding of PIC abolition and how we practice and advance this cause, locally and nationally. The generous support of you and your organization helps Critical Resistance host this summit and build a stronger national abolitionist movement. We wholeheartedly appreciate support at whatever level you are able to give. To foster an inclusive environment, this summit will be completely free to attendees. Registration for this event has closed and all seats are currently full. Seats were offered to organizers with community organizations fighting against the harms of policing, imprisonment, courts, surveillance and the rest of the prison industrial complex. Email Jess@criticalresistance.org if you have questions. If more seats become available, we will make an announcement by email. 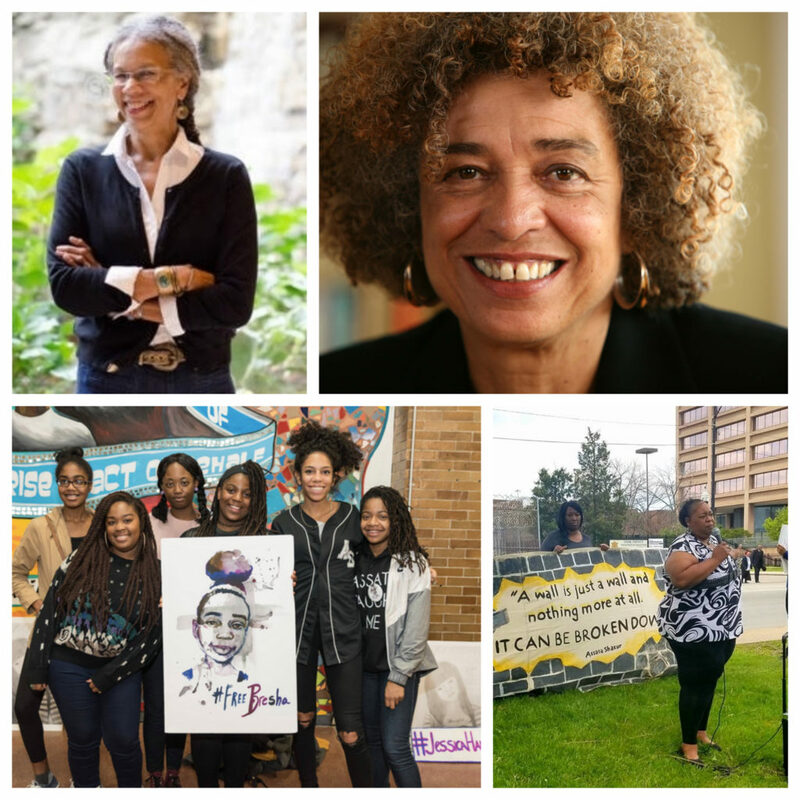 Pre-Event Youth Workshop 6-6:50pm: Join Assata’s Daughters for a workshop before the “No Easy Victories: Fighting for Abolition” Angela Davis, Ruthie Gilmore and Beth Richie event. This workshop will be a great way to introduce young people to the evening’s themes and speakers. Description: Organizing to get police out of your school? Working on responses to harm in the classroom and staffroom that do not involve criminalization? Want a curriculum that creates possibilities to imagine and build a world without prisons and borders? Building to protect students and families from immigration enforcement (ICE)? Come to this panel discussion with K-12 educators, youth advocates and abolitionist organizers that will deepen learning between and across these constituencies and identify needed tools and resources. Description: An event on resisting criminalization, gang databases and policing. More info to come soon…. 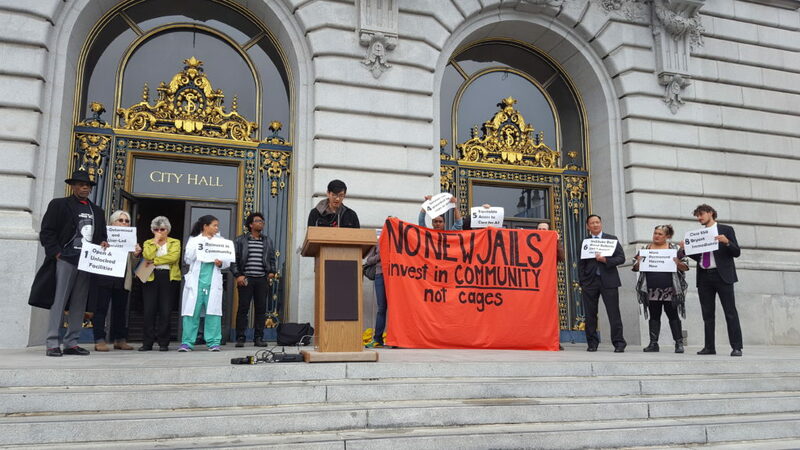 Description: Fight to Win: Shrinking Prisons and Jails / Strengthening Our Communities will be a workshop-style event build sharpen our knowledge of organizing against imprisonment and strengthen strategies to fight for a world without cages. We will explore and discuss successful campaigns around stopping jail construction, ending money bail, advocating for prison closure, and for supporting prisoner-led struggles. Facebook event here. Please share widely! Angela Y. Davis is Distinguished Professor Emerita of History of Consciousness and Feminist Studies at the University of California, Santa Cruz. Davis came to national attention after being removed from her teaching position at UCLA because of her activism and membership in the Communist Party, USA. In 1970 she was placed on the FBI’s Ten Most Wanted List on false charges. During her sixteen-month incarceration, a massive international “Free Angela Davis” campaign was organized, leading to her acquittal in 1972. Today Prof. Davis remains an advocate of prison abolition and has developed a powerful critique of racism in the criminal justice system. She is the author of many books, including her most recent collection, Freedom Is a Constant Struggle: Ferguson, Palestine, and the Foundations of a Movement (City Lights Open Media). Ruthie Wilson Gilmore is Director of the Center for Place, Culture, and Politics, and Professor of Geography, at the Graduate Center of the City University of New York. Author of Golden Gulag: Prisons, Surplus, Crisis, and Opposition in Globalizing California, she is a founding-collective member of California Prison Moratorium Project, Critical Resistance, Californians United for a Responsible Budget, and many other social justice organizations. Beth E. Richie is Professor and Head, Department of Criminology, Law, and Justice at the University of Illinois at Chicago, and author of Arrested Justice: Black Women, Violence and America’s Prison Nation. A founding member of INCITE! : Women of Color Against Violence, Beth is a beloved scholar, advocate and activist who has inspired new generations of anti-violence organizers, Black feminists and abolitionists. 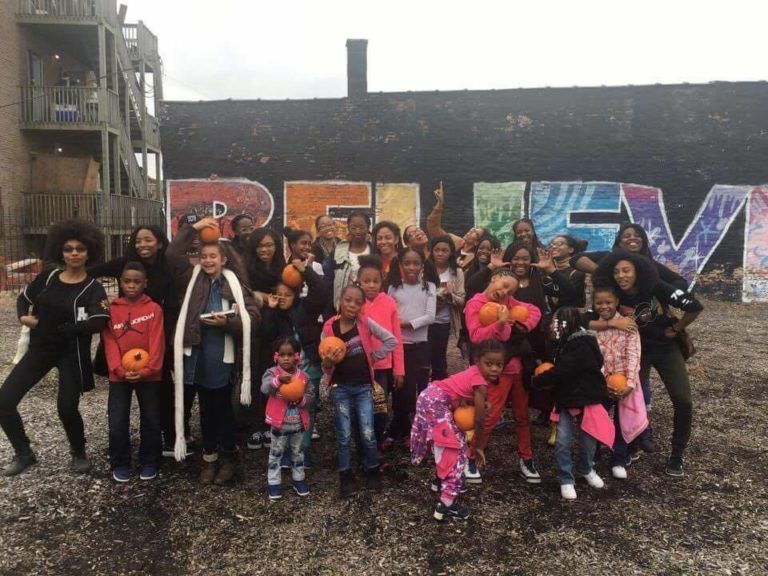 Photos above from: Assata's Daughters, BYP100, and Chicago Community Bond Fund.